Screening for gestational diabetes mellitus (GDM) may be universal or selective based on risk factors. We audited selective screening with an Oral Glucose Tolerance Test (OGTT). Clinical and laboratory details of the first 200 women who delivered a baby in 2017 were analysed. Based on national recommendations, 46.5% (n=93) had maternal risk factors (RF) and an additional 6.5% (n=13) had fetal RF. Nine women with RF, for unexplained reasons did not have their OGTT. Of the 95 who had their OGTT, the diagnosis of GDM was made in 27.4% (n=26). The diagnosis of GDM was made in an additional 8 women outside selective screening giving an overall incidence of 17.0%. More than half of the women needed to be screened selectively for GDM. Compliance with the national recommendations was incomplete and thus the diagnosis of GDM may be missed even in an academic setting. Gestational diabetes mellitus (GDM) is one of the commonest complications of pregnancy. The prevalence varies depending, for example, on the diagnostic criteria, the screening test used, laboratory standards and the population studied. However, the prevalence is increasing globally due to the increasing levels of maternal obesity1. The detection of GDM is important because there are clinical consequences. The woman has an increased risk of pre-eclampsia and of developing Type 2 diabetes mellitus (T2DM) in later life. Up to 70% of those women with GDM develop T2DM by 28 years after the affected pregnancy2. In a pregnancy complicated by GDM there is an increased risk of fetal macrosomia and polyhydramnios due to fetal hyperglycaemia3. This is associated with an increased risk of shoulder dystocia and caesarean delivery4. Neonatal hypoglycaemia may develop due to increased insulin production secondary to intrauterine hyperglycaemia. The offspring also have an increased risk in their childhood and adult life for the development of diabetes, obesity and metabolic syndrome5. While the U.S. Preventive Services Task Force and the Royal Australian and New Zealand College of Obstetricians and Gynaecologists recommend universal screening, it remains controversial6,7. The Health Service Executive in Ireland and the National Institute for Health and Clinical Excellence in the UK recommend selective screening8,9. There is, however, in contemporary practice in Ireland a dearth of information about the proportion of pregnant women who are being screened selectively for GDM, the indications for screening and the incidence of GDM analysed by indication. The aim of this study was to audit selective screening for GDM in an Irish university maternity hospital. The first 200 consecutive women who attended for antenatal care and delivered a baby weighing 500g or more in 2017 were identified. Clinical and sociodemographic details were computerised with identification of risk factors for GDM as defined by national guidelines. The laboratory system was searched for results of the two-hour 75g oral glucose tolerance test (OGTT) and the gestation at the time of screening was recorded. The International Association of the Diabetes and Pregnancy Study Groups (IADPSG) criteria were used to diagnose GDM based on one or more abnormal values with the following thresholds; a fasting glucose ≥5.1 mmol/L, a one-hour value of ≥10.0 mmol/L and a two-hour value of ≥8.5mmol/L10. Birth outcomes which are computerised in the labour ward immediately after delivery were also collected. For pregnancies complicated by GDM, it was assessed if a postnatal OGTT was performed with the World Health Organization (WHO) criteria applied to detect persistent impaired glucose tolerance or diabetes mellitus. SPSS version 24 (IBM Corporation, Armonk, New York) was used to derive descriptive statistics. Of the 200 women, 60.5% were Irish-born, 38.5% were nulliparas, 25.0% were obese and 11.5% were smokers. The mean age was 31.8 years (standard deviation (SD) 5.6). A total of 93 women had maternal risk factors identifiable at the first visit, and 84 (90.3%) underwent an OGTT at a mean gestation of 27.3 weeks (range 18-37 weeks, SD 2.5) with 24 (28.6%) testing positive. Of the nine women with risk factors who did not have their OGTT, four were obese. Around 6 women with fetal risk factors also had maternal risk factors identified at the first antenatal visit and were tested between 26 and 28 weeks. Table 1 shows the indications for OGTT and the results. The most common risk factors at the first visit were a Body Mass Index (BMI) ≥30 kg/m2 (46.2% (n=43)), a family history of diabetes mellitus in a first degree relative (47.9% (n=45)) and Polycystic Ovary Syndrome (PCOS) (17.0% (n=16)). Of the women screened, 48 (57.1%) had one maternal risk factor (with 13 (27.1%) testing positive), 27 (32.1%) had two maternal risk factors (with 8 (29.6%) testing positive) and 9 (10.7%) had three or more risk factors (with three testing positive (33.3%)). No women had the risk factor of persistent glycosuria or chronic steroid use. A further 13 women had fetal risk factors which arose during the pregnancy (polyhydramnios or suspected fetal macrosomia). Of the 13 with fetal risk factors only, 11 had an OGTT at a mean gestation of 34.2 weeks (range 29.0-37.6 weeks (SD 2.9)) with two (18.1%) positive results. There were 5 women with fetal risk factors in the presence of maternal risk factors with two women testing positive (40.0%). Considering the risk factor of maternal age, there were 7 women tested for this reason, 6 (85.7%) of whom had a total of two to four risk factors with three women (42.9%) testing positive and one other had a pre-existing diagnosis of diabetes mellitus. There were 5 women (2.5%) diagnosed with GDM before the time of the OGTT and there were four (2.0%) women with pre-existing diabetes mellitus (DM) (two with type one DM and two with T2DM). Another 9 women (4.5%) had an OGTT at a mean gestation of 31.1 weeks (range 28.0-35. One weeks, SD 2.9) but we were unable to identify any risk factor from the records. Three of the women tested positive. 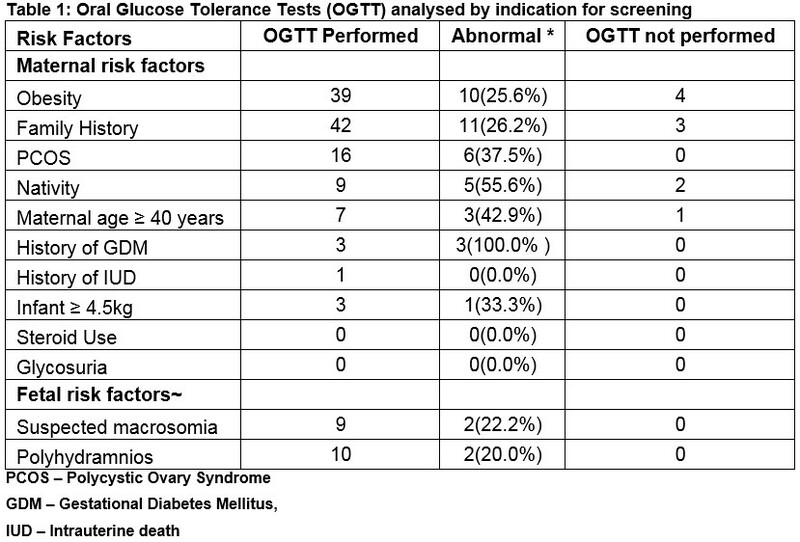 Of the 104 OGTTs, 29 (27.9%) met the criteria for GDM (with three diagnosed with a repeat GTT out of a total of 16 women having a repeat test conducted). Including the 6 women diagnosed before the OGTT, the incidence of GDM was 17.0% (n=34). In the postnatal period 20 (58.8%) of women with GDM underwent a postnatal OGTT and there was a single diagnosis of impaired glucose tolerance. Delivery outcomes including gestation at delivery, birth weight, induction and caesarean section rate, are shown for the cohort analysed according to the diagnosis of GDM. (Table 2) There was one case of shoulder dystocia involving a woman with GDM with an infant weighing 4.1 kg at 39 weeks gestation. This audit of contemporary obstetric practice found that more than half of women attending for antenatal care were screened selectively for GDM based on risk factors as recommended in the 2010 National Clinical Guideline8. The overall prevalence in the 200 women was 17.0% Compliance with selective screening recommendations, however, was incomplete even in an academic setting which means the diagnosis of GDM could be missed with the potential of adverse clinical outcomes for either the woman or her baby. All women diagnosed with GDM during pregnancy should be retested after delivery to exclude T2DM and this was done in 58.8% of cases audited. While suboptimal, this compares well with previous reports internationally, (for example 45% in a cohort of 344 American women)11 and is probably a reflection of close supervision of the women by a dedicated midwifery specialist as part of the multidisciplinary diabetes mellitus team. This audit has strengths. It was based on consecutive unselected deliveries in a large university hospital which accepts women without differentiation across all socioeconomic groups and across the urban-rural divide, including women who are privately insured. The Hospital practice is based on the 2010 National Guideline for GDM 8 and the diagnosis of GDM is based on the 2013 WHO criteria (WHO, 2013). The diagnosis of maternal obesity was based on the measurement of maternal weight and height which is more accurate than self-reporting12. A limitation of the study is that, like other maternity units and other countries, the latest international standards for the pre-analytical handling of samples and the prevention of glycolysis have not yet been implemented13. It is likely, therefore, that the incidence of GDM was underestimated14. The audit is also a small sample in a single hospital where there is a multidisciplinary service for women diagnosed with GDM. Thus, the findings may not be replicated in other settings. Previous national audits have found wide variations in the implementation of national guidelines and there is strong possibility that in other maternity units, fewer women are being screened selectively based on their risk factors15. There is no consensus at an international level on who should be screened for GDM. It has been argued that women who have GDM but no apparent risk factors have a milder form of GDM that is of lower clinical significance16. This has been countered by research which found that selective screening compared to universal screening misses a significant proportion of women (120 of the 681 in the cohort studied) and, furthermore, that the outcomes in these pregnancies are worse (higher rates of hypertensive disorders, caesarean delivery, polyhydramnios and admission of the infant to the neonatal intensive care unit (NICU) compared to women with normal glucose tolerance)17. A French study which applied universal screening to a cohort of 2187 women would have missed one sixth of GDM cases (53/309) with an incidence of GDM of 2.4% in women despite the absence of risk factors18. They found that the rate of large-for-gestational-age infants, the mean fasting plasma glucose and the requirement for insulin was all decreased in women without RFs compared to those with RFs. Universal screening resulted in 770 negative tests in women with no RFs, arising in 14 tests required to detect one additional case of GDM. The authors propose that screening tests could be avoided in low risk women by an opt-out approach. Considering the implication of universal screening, this is undoubtedly associated with the testing of women without risk factors who will test negative which is an inconvenience for them and the cost of testing and increased workload must also be considered.19 Increasing identification of GDM brings about associated increases in laboratory testing, ultrasound scans, intervention including caesarean section and an increase in the rate of induction of labour20. An advantage of universal screening is that this is associated with earlier diagnosis of GDM and implementation of the necessary management. This is because selective screening requires the recognition of risk factors and appropriate planning of the test. A hospital which changed their practice from selective to universal screening reported a corresponding reduction in the rate of large for gestational age infants (20% vs 14%) with the only reported difference in management in this time period being the screening approach21. With improved identification and thus treatment of GDM, this means potential complications including macrosomia, shoulder dystocia and associated brachial plexus injury may decrease.22 Shoulder dystocia is estimated to account for up to 11% of all obstetric claims and is one of the four most common causes of medical litigation23,24. Furthermore, the diagnosis of GDM identifies women that have an increased risk of developing Type 2 Diabetes Mellitus (T2DM) in later life. With modification of risk factors through diet and exercise, the onset of T2DM can be prevented or delayed25. Also, if screening in the years after delivery is adhered to, this will allow early identification and intervention. While 8.7% (n=9) of all OGTTs were conducted for women with no identifiable risk factors, three cases of GDM were diagnosed. This may raise the argument for universal screening for GDM but at present there is no cost-benefit analysis available. We believe that the information in this contemporary audit will prove useful for the planning of the maternity services in the future. It also reinforces that education of clinical staff is important for the identification of RFs in a service that opts for selective screening to identify GDM. 1. American College of Obstetricians and Gynecologists. Gestational diabetes Mellitus. ACOG practice bulletin no. 190. Obstet Gynecol. 2018 Feb;131(2):e49-e64. 2. Kim C, Newton KM, Knopp RH. Gestational diabetes and the incidence of type 2 diabetes: a systematic review. Diabetes care. 2002 Oct 1;25(10):1862-8. 3. Schaefer-Graf UM, Pawliczak J, Passow D, Hartmann R, Rossi R, Bührer C, Harder T, Plagemann A, Vetter K, Kordonouri O. Birth weight and parental BMI predict overweight in children from mothers with gestational diabetes. Diabetes care. 2005 Jul 1;28(7):1745-50. 4. Athukorala C, Crowther CA, Willson K. Women with gestational diabetes mellitus in the ACHOIS trial: risk factors for shoulder dystocia. Aust N Z J Obstet Gynaecol . 2007 Feb 1;47(1):37-41..
6. Moyer VA. Screening for gestational diabetes mellitus: US Preventive Services Task Force recommendation statement. Ann. Intern. Med. 2014 Mar 18;160(6):414-20. 11. Russell MA, Phipps MG, Olson CL, Welch HG, Carpenter MW. Rates of postpartum glucose testing after gestational diabetes mellitus. Obstet Gynecol 2006 Dec 1;108(6):1456-62. 12. Fattah C, Farah N, O’Toole F, Barry S, Stuart B, Turner MJ. Body Mass Index (BMI) in women booking for antenatal care: comparison between selfreported and digital measurements. Eur J Obstet Gynecol Reprod Biol. 2009 May 1;144(1):32-4. 13. Sacks DB, Bruns DE, Goldstein DE, Maclaren NK, McDonald JM, Parrott M. Guidelines and recommendations for laboratory analysis in the diagnosis and management of diabetes mellitus. Clin. Chem. 2002 Mar 1;48(3):436-72. 15. O’Higgins A, Dunne F, Lee B, Smith D, Turner MJ. A national survey of implementation of guidelines for gestational diabetes mellitus. Ir. Med J. 2014 Sep 1. 16. Naylor CD, Sermer M, Chen E, Farine D. Selective screening for gestational diabetes mellitus. N Engl J Med.1997 Nov 27;337(22):1591-6. 17. Avalos GE, Owens LA and the ATLANTIC DIP Collaborators. Applying Current Screening Tools for Gestational Diabetes to a European Population: Is It Time for Change? Diabetes Care. 2013 Oct;36(10):3040-4. 18. Miailhe G, Kayem G, Girard G, Legardeur H, Mandelbrot L. Selective rather than universal screening for gestational diabetes mellitus?. Eur J Obstet Gynecol Reprod Biol. 2015 Aug 1;191:95-100. 19. Waugh N, Pearson D, Royle P. Screening for hyperglycaemia in pregnancy: Consensus and controversy. Best Pract, Res. Cl. En. 2010 Aug 1;24(4):553-71. 21. Legardeur H, Girard G, Journy N, Ressencourt V, Durand-Zaleski I, Mandelbrot L. Factors predictive of macrosomia in pregnancies with a positive oral glucose challenge test: importance of fasting plasma glucose. Diabetes & metabolism. 2014 Feb 1;40(1):43-8. 22. Crowther CA, Hiller JE, Moss JR, McPhee AJ, Jeffries WS, Robinson JS. Effect of treatment of gestational diabetes mellitus on pregnancy outcomes. N Engl J Med. 2005 Jun 16;352(24):2477-86. 25. Knowler WC, Barrett-Connor E, Fowler SE, Hamman RF, Lachin JM, Walker EA, Nathan DM. Reduction in the incidence of type 2 diabetes with lifestyle intervention or metformin. Scand J Med Sci Sports. 2003 Jun 1;13(3):208.